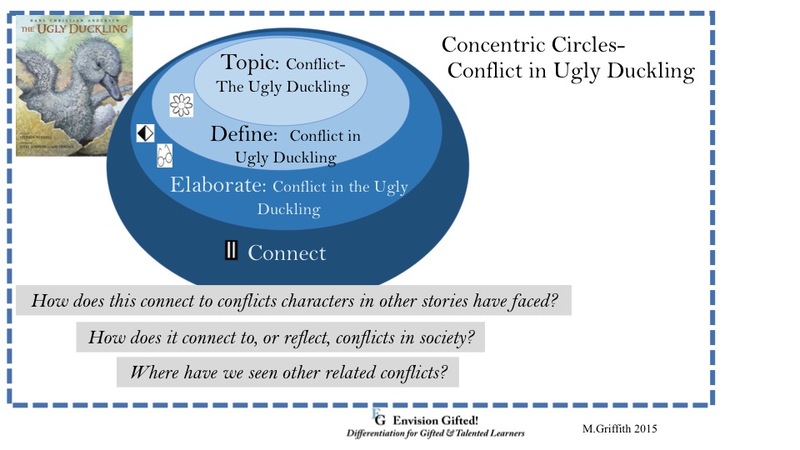 Below are examples from two well-known stories: The Grasshopper and the Ant, with questions below relating to each circle; The Ugly Duckling example is a little more complex. Here we start with the topic: Conflict. Then move on to defining the conflict in the story, to using Depth and Complexity to Elaborate on the conflict, and finally moving outside the context of the story to explore conflict. Concentric Circles can be completed in a variety of groupings, from individual, to partners, to whole class. 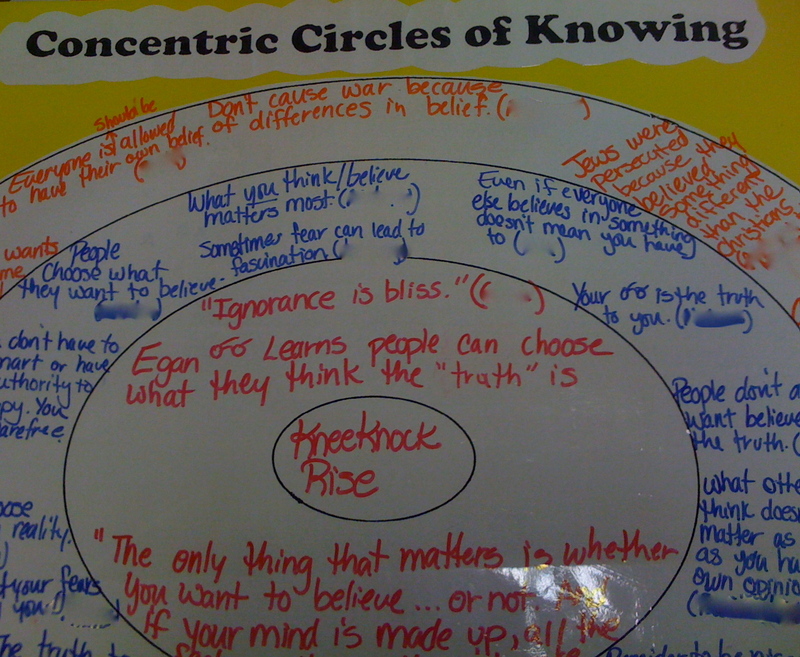 Regardless of how you implement them in your classroom, your first concentric circle should be whole group. 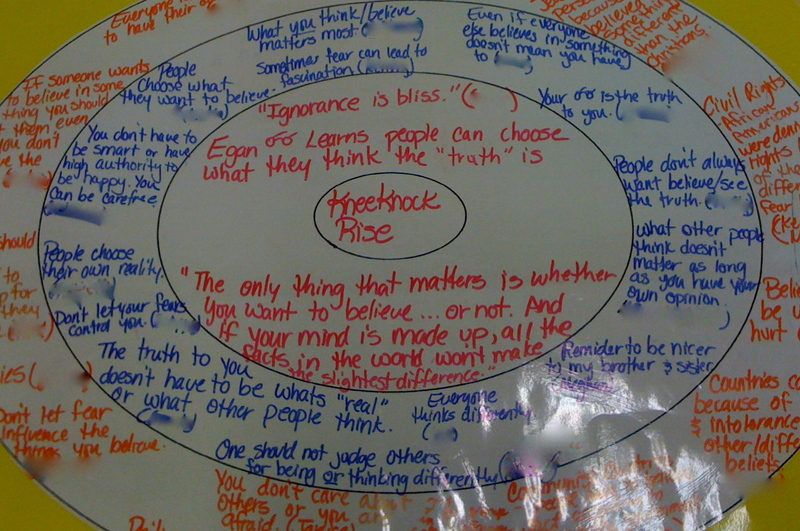 Here we used concentric circles to analyze the story, Kneeknock Rise. This was done after we finished reading and discussing the book. This model allowed us to examine the story in the context of the story itself and then ripple out and analyze the significance of the message(s) of the story for our society and then more broadly to the world. 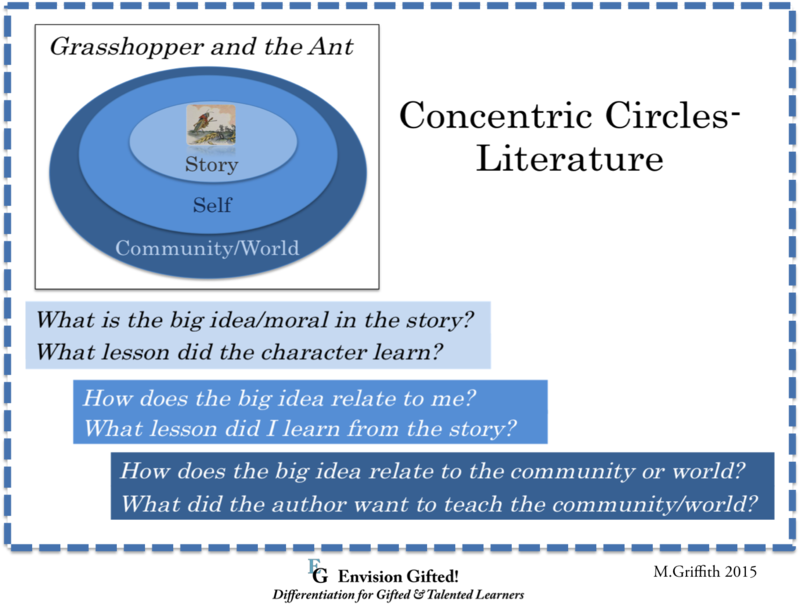 The innermost circle contains the title (point of impact) and the circle enclosing that circle houses important ideas and quotes the students identified from the story. 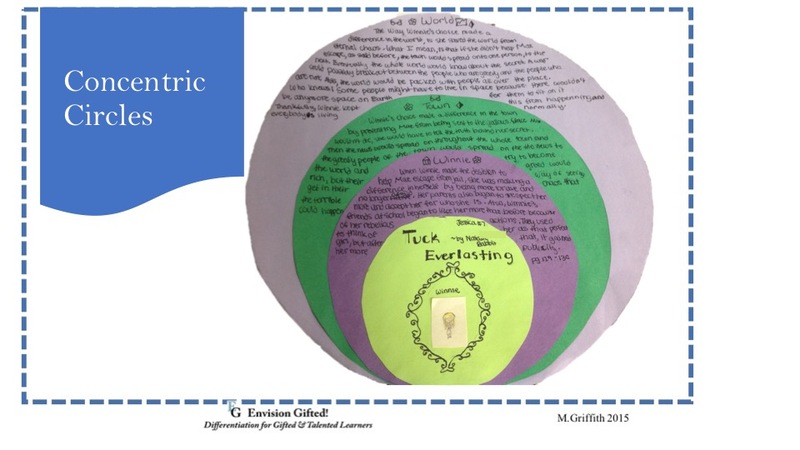 These ideas (scribed in the concentric circle poster) came from students during whole group discussion (I blurred their names on the images to the left). In looking at the story in the context of the story, students noted, “Egan learns that people can choose what they think the truth is”. One student shared the common phrase “Ignorance is bliss”. They also shared what they thought was the most important quote from the story. The outer circle, relating to the world, was not surprisingly, more rigorous and difficult for some of the students. Despite this, they were successful. The comments in this circle mostly surrounded the idea of difference and tolerance. They included: “Don’t cause war because of differences in belief.”, “Jews were persecuted because they believed differently than the Christians.”, and “Belief can be used to hurt others”. It should be noted that these comments and this level of analysis would not be possible in the absence of discussion (whole and small group). These two images (left and below) are great examples from a colleague of mine, Ann Dondero, who teaches 5th Grade. 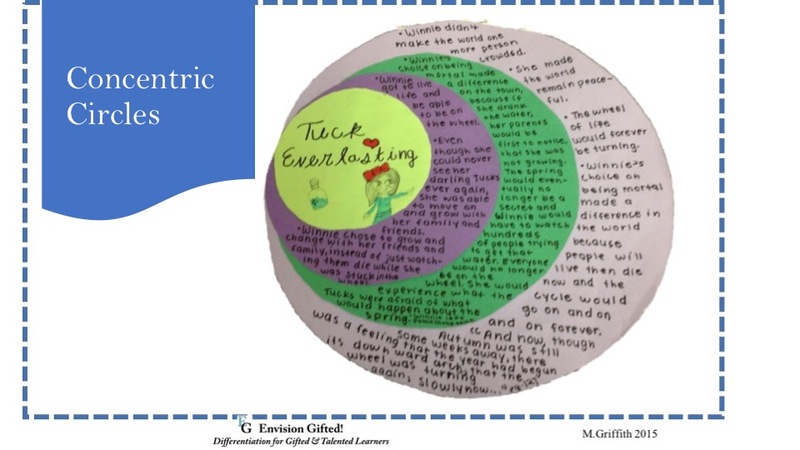 Students explored the story, Tuck Everlasting through the process of concentric circles.